The Hytra is often mentioned in one breath together with the ‘Funky Gourmet‘ or the ‘Aleria‘ but frankly, it does not play in the same league. 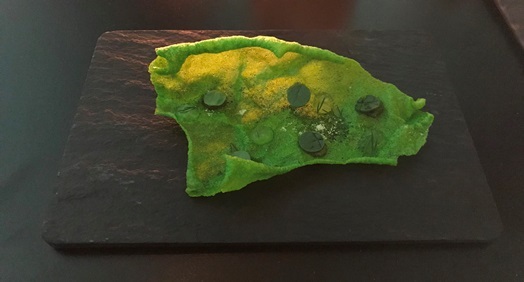 I went for the “Think Green Tasting Menu” (EUR 48.00) which started with a “Spanakorizo (spinach cream, dill, lemon)” which was basically a chip with little tasty dots. And it was mouth-watering and delicious! So my expectations were high, however, they were not quite met. 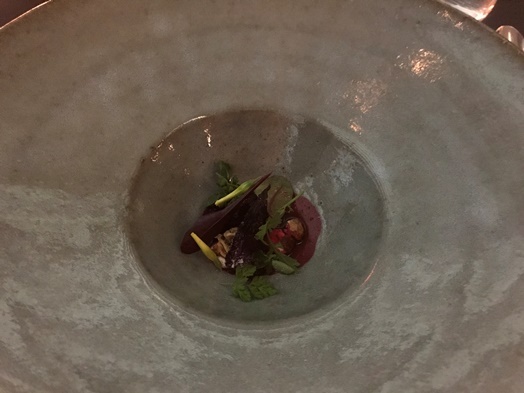 The first course of the menu was “beetroot (walnuts, yogurt, rocket flowers)” which was tiny and rather average. 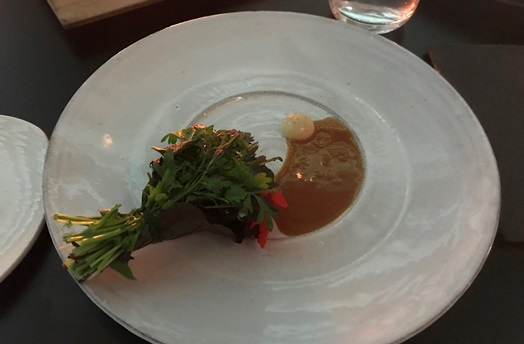 The “Chef’s Garden (combination of herbs, greens, vegetables, edible flowers)” was interesting in terms of how the dish was served. I mean, when do you get a bunch of greens wrapped together to dip in the salad sauce and eat like that. So, I liked it quite a lot as it was ‘new’ and interesting. No revelation in terms of flavor though. 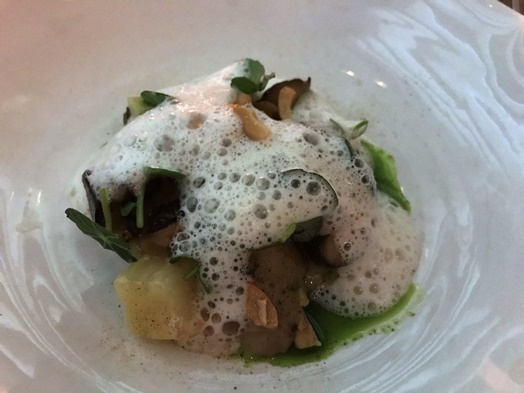 The “celeriac (mushrooms, cashew nuts, Kariki cheese from Tinos)” was good as the foam created a pleasant layer of overarching taste. 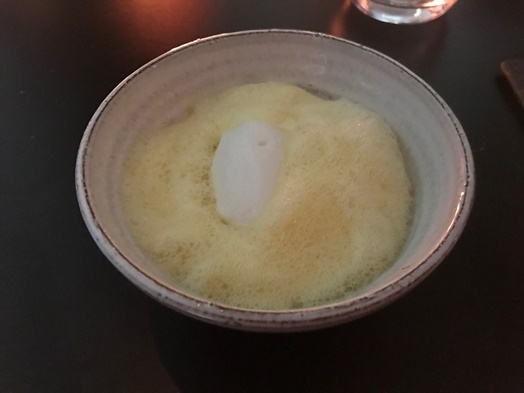 A course which wasn’t really on the menu but I liked a lot nevertheless was the “bread course with olive oil and thyme”. 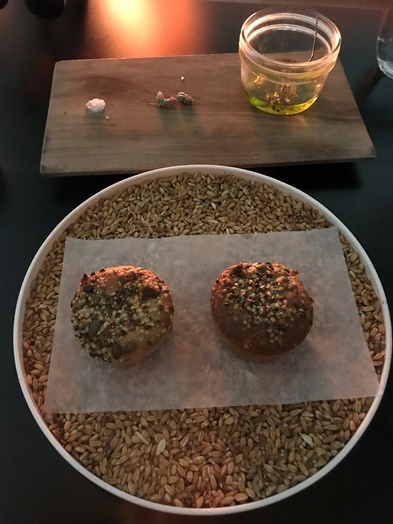 The bread was made with hemp seeds, pumpkin seeds and another kind of seeds and was super tasty by itself. If you dipped it in the Greek olive oil, it became even better. And if you would add that sprig of thyme to it, yummy-licious! 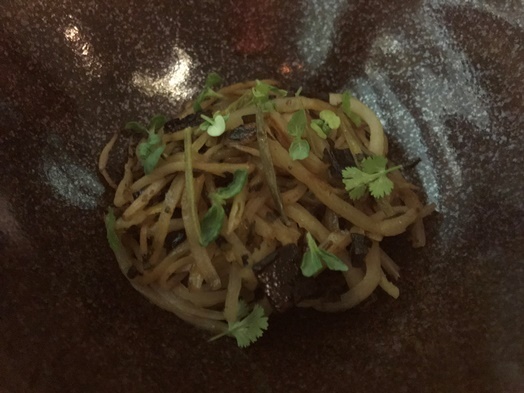 My second favourite course were the “salsify spaghetti (rock samphire, basil, mushroom dashi)” – especially with the mushroom reduction which was poured over it! Simple and yet so intense in terms of flavor. 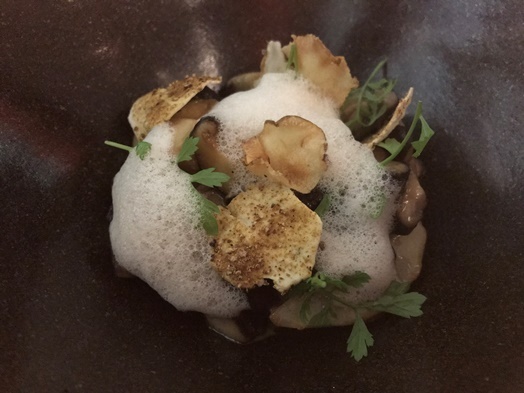 The “topinambur (mushrooms, chestnut)” was okay but largely the same again – same foam, mushrooms again. I mean, there is eight courses and I personally understand that cooking vegetarian is probably trickier than if you can chose from a whole lot of different types of meats and seafood but the same ingredients within three courses? The first dessert, the “mandarin (dark chocolate, sea-buckthorn, coconut)” was very good again though. Mainly though because I really like coconut. The chocolate was a bit overlapping though in its intensity. 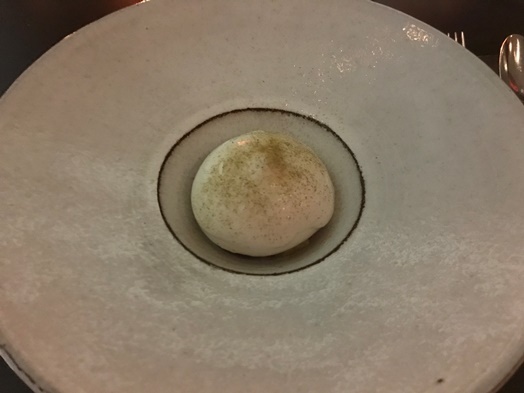 The second dessert was also quite outstanding, the “Wild Almond (damson, grape, wild mint, soumada)” had this amazing taste of ‘almonds’ I love so much. So, the desserts really took off but if you look at the menu itself, it doesn’t reach the refined cuisine of ‘Funky Gourmet’ or ‘Aleria’. The service is generally very friendly and tries hard but you can see that they are uncoordinated to some degree. Not sure who serves the dish and who explains it, sometimes two waiters trying to bring an empty wine glass for the next wine. Now, that’s lovely but somehow defeats the purpose of efficient service. The prices are, on the other hand, very reasonable (which, I suppose, also reflects in the tasting menu) with EUR 4.50 for a “double espresso” or EUR 7.00 for “San Pellegrino, 0,75l”. Still, if you are maybe not as spoiled as me, then the Hytra is definitely worth trying – and make sure to book in advance as the place gets super crowded around 9pm.